Apply the dabber to the rubber stamp and stamp the background. Use a heat gun to speed drying time. Cut a page from a vintage children's book and apply it to cover an index tag. I loved this one because the design mimics the graphics on Jenni's banner stickers. 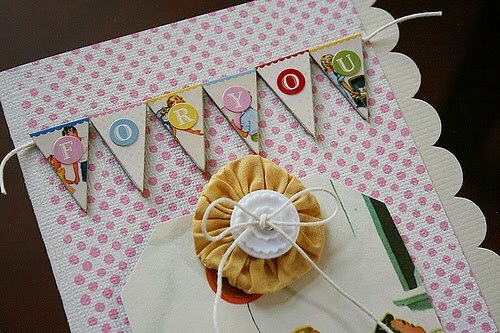 Embellish the tag with the fabric yoyo and button. Add banner stickers to the chipboard elements and adhere to top of card. Add alphas to spell out a sentiment if desired. Add a piece of trimmed scallop edged cardstock along the length of the card. I have so many old vintage books. 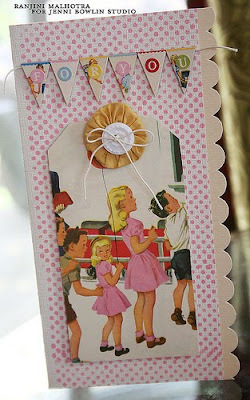 This post will keep me busy making some fun cards. Thanks for such a fun and great idea.